Yves and co-authors will receive the award at the 2012 PRACE Scientific Conference, which will be held on the 17th of June in Hamburg, in conjunction with ISC12. 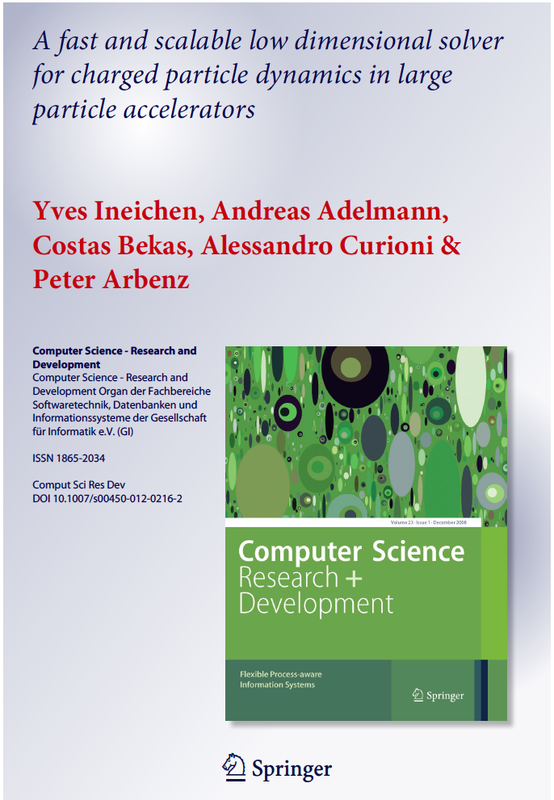 Costas will also present the paper at the ISC12 Conference on Tuesday, June 19, 2012. This paper demonstrates how HPC can be used in real time to tune the operation of particle accelerators, which are invaluable tools for research in the basic and applied sciences, in fields such as materials science, chemistry, the biosciences, particle physics, nuclear physics and medicine. The design, commissioning, and operation of accelerator facilities is a non-trivial task, due to the large number of control parameters and the complex interplay of several conflicting design goals. The team from IBM Research, Paul Scherrer Institute and ETH Zürich achieved strong and weak scalability improvement on BlueGene/P of two orders of magnitude for the most heavily used component of the optimisation framework, which computes the evolving shape of the bunches of particles in the beam. This enables thousands of such calculations to be performed in a matter of minutes, creating close to on-line optimisation capability.